What is the Conservation Tillage and Cropping Systems Workgroup? Established in 1998, the Conservation Cropping Systems Workgroup is a diverse group of more than 1,500 farmer, University of California, California State University, USDA - NRCS, Resource Conservation District, public agency, private sector and environmental group members that have come together to promote conservation cropping systems in California. 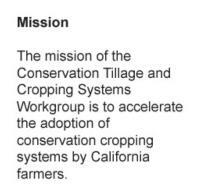 The vision of the Conservation Cropping Systems Workgroup is to achieve resource-preserving and economically viable conservation agriculture systems in California. These systems contribute to greater production efficiencies, reduce negative environmental impacts, ease labor requirements, and result in more vibrant farm economies. To increase funding for conservation cropping systems research, education, and adoption in California. Determine Central Valley cropping acreage amenable to conservation cropping systems and use biennial CT acreage surveys to track adoption progress. Develop agreed-to definitions for “conservation tillage” and descriptions of different “levels” of conservation tillage implementation in order to avoid confusion of practices, equipment, and terms. Conduct a survey of Central Valley farmers to determine the obstacles to greater adoption of conservation cropping systems and determine how farmers get the information they trust and use (e.g., newsletters, workshops, ag consultants, farm advisors, NRCS, grower associations, etc. ); use the survey results to increase the effectiveness and efficiency ofour information campaign. Conduct a literature search on the long-term impacts of sustained conservation tillage in different cropping systems and use the information to modify the CT research program as needed. Develop a network of “on-call” conservation tillage advisors/mentors (farmers who are proficient in conservation tillage techniques) available to new practitioners of conservation cropping systems in order to reduce common problems encountered in implementing a new cropping system. Conduct field activities (field days, demonstrations, etc.) to show basics of conservation cropping systems, successful conservation cropping systems, and to discuss new information related to adopting conservation tillage practices. Continue to conduct research related to links between conservation cropping systems and positive environmental impacts. Determine and develop an appropriate technology transfer capacity; i.e., more technical advisers, to enable increased adoption of conservation cropping systems. Create and implement an information and education campaign to increase awareness of the general public, environmental groups, private sector (conservation tillage equipment dealers, agricultural management companies, and other agricultural consultants), and regulatory agencies of the use of conservation cropping systems and the positive impacts these systems have on air, water and soil quality as well as agricultural economics. Create a conservation cropping systems speaker’s bureau for California in order to increase awareness, adoption, and financial support of conservation cropping systems programs. Develop conservation cropping systems information materials for farmers, ag support industries, K-12 students, university, and general public audiences. Form a Conservation Cropping Systems Research Information Center (RIC) to compile, consolidate, and disseminate information. Develop and provide environmental benefits information on conservation cropping systems to emissions trading associations and exchanges as well as mitigation banks as a means to increase farm income and adoption of conservation cropping systems. Establish a conservation cropping systems website. Prepare a downloadable conservation tillage videos and distribute it to at least 500 farmers, equipment dealers, and representatives of farm-related industries. Staff an information booth at the Tulare World Ag Expo and have CT information available in coordinated manner. Enlist the private sector (conservation tillage equipment dealers, agricultural management companies, and other agricultural consultants) to help disseminate information on conservation tillage. Cultivate media contacts to increase coverage of conservation tillage activities. Meet with all California Farm Bureaus and other grower associations to introduce / update them on the work of the Conservation Cropping Systems Workgroup. Prepare conservation cropping systems posters and visuals for prominent display in various locations throughout the Central Valley of California (equipment and chemical dealers, restaurants and coffee shops, farm and ranch suppliers, etc.). Create a staffing plan to accomplish these information and education activities. Conduct a series of emissions trading and mitigation banking workshops. Create and maintain national and international alliances with conservation tillage and conservation agriculture organizations in order to remain focused, energized, and benefit from the synergy of being involved with these organizations. Prioritize the fundraising initiative, develop a budget, and determine a course of action in order to increase funding for implementation of this Strategic Plan and increased adoption of conservation cropping systems. Obtain written support for our strategic plan from the Conservation Tillage Workgroup, UCCE, NRCS, Resource Conservation Districts, the private sector, environmental groups, and the general public to enhance funding activities. Seek written support from cities, counties, elected representatives, ag community, environmental agencies in order to enhance funding opportunities. Identify organizations and agencies that are potentially interested in funding conservation cropping system activities. Include “partial funders” in the fundraising initiative who may only be able to fund part of our program. Determine what information/products (e.g., an increase in CT acreage with resulting air and water quality benefits) other agencies need in order to meet their environmental goals so that those agencies can then support our Conservation Cropping Systems Workgroup with additional funding. Target fundraising from organizations and agencies that can benefit from the adoption of conservation cropping systems. Secure a well-known personality to champion conservation cropping systems in California (Angelina Jolie, Governor Schwarzenegger, Huell Howser, Wilfred Brimley, Kevin Costner, and Ed Begley, Jr.) in order to raise public awareness – and, thus, support - of the efforts that agriculture is making toward a cleaner environment.